Nick has always had a natural talent as a free hand artist. Over the years, he’d spend any free time dabbling with painting and illustrating, fine tuning his self-taught skills. 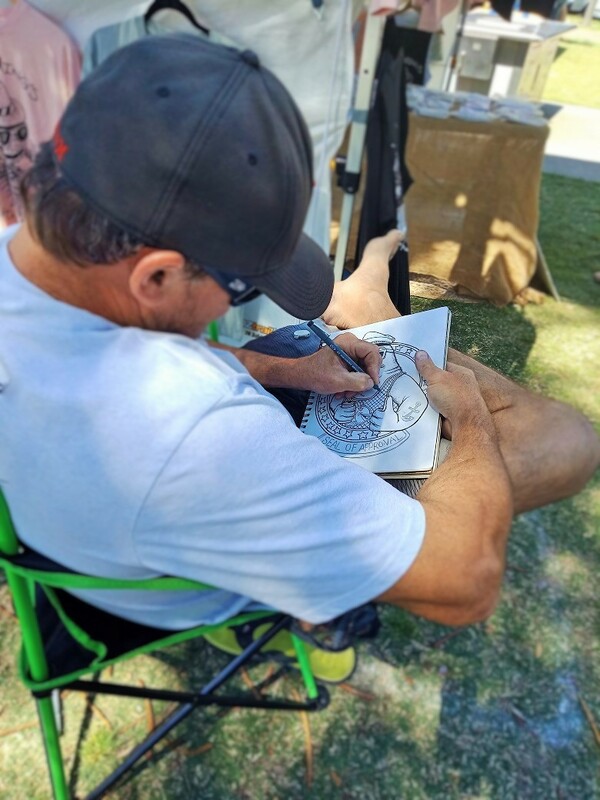 Encouraged to take his art further by everyone who saw it, Nick eventually began turning his sketches and illustrations into canvases and printed pieces. In late 2017, Nick and his wife Chris decided to develop a line of tee shirts and accessories to start showing and selling at local beach markets and events. Living on the Gold Coast, with the ocean on his doorstep, it was natural that Nick’s first line of tees combined his passions for surfing with his love of the ocean. So, with a tropical influence and a fun retro feel thrown in, Nick’s “style” emerged and Drawn Downunder “surf-brand” apparel was born. The response was overwhelming, with Nick’s style and designs quickly amassing a following and the collection quickly grew. Along with the popular surf-wear, Nick’s love of animals sees him producing art and apparel to represent our beautiful animal friends – both domestic and wildlife. This, along with several other ranges are now well underway, bringing a diversity of themes under the Drawn Downunder umbrella. Nick frequently gets requests for custom designs and this has seen the rise of his “Pen for Hire” service. He has created images for everything from company logos and team tee shirts through to wedding invitations and bumper stickers. Additionally, Nick has designed characters and images for retailer’s exclusive apparel lines both here and internationally. Everything has his special touch and personal flare! Everything Nick draws is free hand and original. Nick and his wife Chris share their life with their adorable fur-kids, Bumble and Squid – two crazy-cute little pugs who provide plenty of inspiration for art and have become part of the framework, warmth and love that is Drawn Downunder. Drawn Downunder – Drawn to Good Vibes!